We Drink Your Milkshake! : IRON LADY teaser trailer: Meryl looks fierce! IRON LADY teaser trailer: Meryl looks fierce! We love her here at WDYMS, and she's pretty much the queen of the cinema. Anything she touches pretty much turns to gold. Now, her new movie, THE IRON LADY, Meryl Streep takes the title role as the notorious enigmatic British Prime Minister Margaret Thatcher. We've been teased with some pictures of Streep as Thatcher, and now we're treated to a quick glimpse of the upcoming biopic. 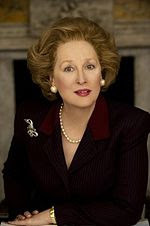 THE IRON LADY will be released January 2012 starring Meryl Streep, Jim Broadbent, Anthony Head, and Richard E. Grant. Notorious seems so harsh. Like Thatcher is a pirate to be feared. Maybe enigmatic or even influential. Depends on how one looks at her and what she did. However, I agree...enigmatic is a much better word. Great suggestion!